According to HOM committee members, one goal of the farmers market is to give the public access to fresh, local food after business hours. The other is to create a unique, fun and educational event for the community that showcases local entrepreneurs working together, and ideas on preparing food using the seasonal harvest. Attendees enjoy shopping at the market and the element of surprise in the Supper Series as local chefs create dishes around the seasonal produce and farm products. "There&apos;s a "Chopped" [Food Network television series] feel to it, where the restaurants have to work around what is available," said Laura Eberly, president of HOM. Customers can enjoy the relaxed, community atmosphere of the deck, eat at picnic tables with friends and neighbors and listen to live music every week. The Cellar Restaurant, Las Chicas Taqueria and the Kitchen Store prepare fresh meals, snacks and desserts using local ingredients right on the deck, each adding their unique taste and presentation. "This fun event will bring people together to celebrate our locally produced food, the skills of our chefs and farmers, and improve nighttime activities and entertainment in our downtown," said Eberly. 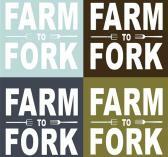 Farm to Fork Evening Market and Supper Series takes place every Thursday beginning at 4 p.m. on the sidewalk areas and deck located on Front Street, in the middle of downtown Owego&apos;s Historic River Row on Front Street. For more information, email owegomerchants@gmail.com or visit their Facebook page to see what is new for the week https://www.facebook.com/OwegoFarmtoForkEveningMarket .